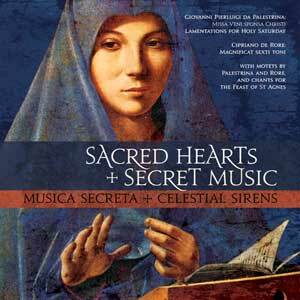 Sacred Hearts , Secret Music by Musica Secreta & Celestial Sirens has been added to CEU Medieval Radio’s playlist. The album is a sixteenth-century ‘sound-track’ to Sarah Dunant’s novel Sacred Hearts, the third in her Renaissance trilogy published in July 2009. Set in 1570, the novel is about Serafina, who falls in love with her music tutor and refuses the arranged marriage into the wealthy Milanese family intended for her. As a result, she is forcibly enclosed in a Benedictine convent in Ferrara where she discovers that her voice is not only her greatest gift, but also her means of escape from the imprisonment. This is not only a recital that illustrates the book as its story unfolds, but also a huge repertoire of music that must have been sung by talented nuns within the confines of their orders in the early modern period. Despite the punishing restrictions inflicted on the sisters the music is glorious. Musica Secreta is four voices with harp, organ and bass viol, formed in 1990 by Deborah Roberts. They are joined for this recording by her other groups, Celestial Sirens, a female non-professional choir of eighteen voices that came into being in 2003, and the sextet Sacred Hearts Schola, all centred in Sussex, south east England. This is a recording to be treasured and frequent playing will long be rewarding.